Diabetes often remains undiagnosed until symptoms become severe. If left untreated, diabetes can cause numerous health complications. That’s why it’s crucial to know the warning signs. Symptoms of Type 1 diabetes often appear suddenly and are often the reason for checking blood sugar levels. Because symptoms of other types of diabetes and prediabetes come on more gradually or may not be evident. Anyone who has symptoms of diabetes should be tested for the disease. 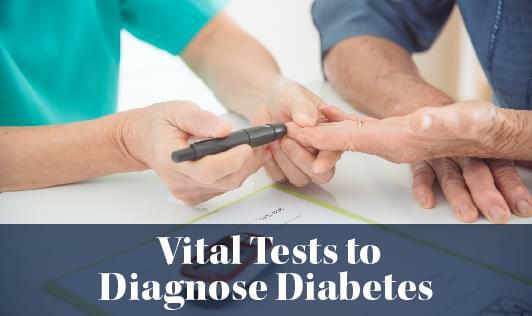 Some people will not have any symptoms but may have risk factors for diabetes and need to be tested. Testing allows health care professionals to find diabetes sooner and work with their patients to manage diabetes and prevent complications. Testing also allows health care professionals to find prediabetes. If you have any of these symptoms, see your health care provider right away. Diabetes can only be diagnosed by your healthcare provider. If your blood glucose levels are normal, you should be tested every three years. If you have prediabetes, you should be checked for diabetes every one to two years after that diagnosis. The A1C test can diagnose prediabetes and diabetes. It measures your average blood glucose control for the past two to three months. This test is more convenient because no fasting is required. An A1C of 5.7 percent to 6.4 percent means that you have prediabetes, and you’re at high risk for the development of diabetes. Diabetes is diagnosed when the A1C is 6.5 percent or higher. A fasting plasma glucose test requires fasting (nothing to eat or drink except water) for eight hours before the test. 100 to 125 mg/dL Prediabetes (also called Impaired Fasting Glucose) Blood glucose levels are higher than normal, but not high enough to be diagnosed as diabetes. This condition increases the risk of developing Type 2 diabetes, heart disease, and stroke. 126 mg/ dL or more Diabetes mellitus (type 2 diabetes) Type 2 diabetes develops when your body doesn’t make enough insulin or develops “insulin resistance” and can't efficiently use the insulin it makes. It greatly increases your risk of heart disease and stroke. This test measures how well the body handles a standard amount of glucose. 140 to 199 mg/dL Prediabetes (also called Impaired Fasting Glucose) Blood glucose levels are higher than normal, but not high enough to be diagnosed as diabetes. This condition increases the risk of developing Type 2 diabetes, heart disease, and stroke. 200 mg/dL or higher Diabetes mellitus (type 2 diabetes) Type 2 diabetes develops when your body doesn’t make enough insulin or develops “insulin resistance” and can’t efficiently use the insulin it makes. It greatly increases your risk of heart disease and stroke. Your healthcare provider may regularly perform a test called HbA1c (A1C, or Glycosylated Hemoglobin Test). An A1C test provides a picture of your average blood sugar control for the past two to three months. Blood sugar is measured by the amount of glycosylated hemoglobin (A1C) in your blood.